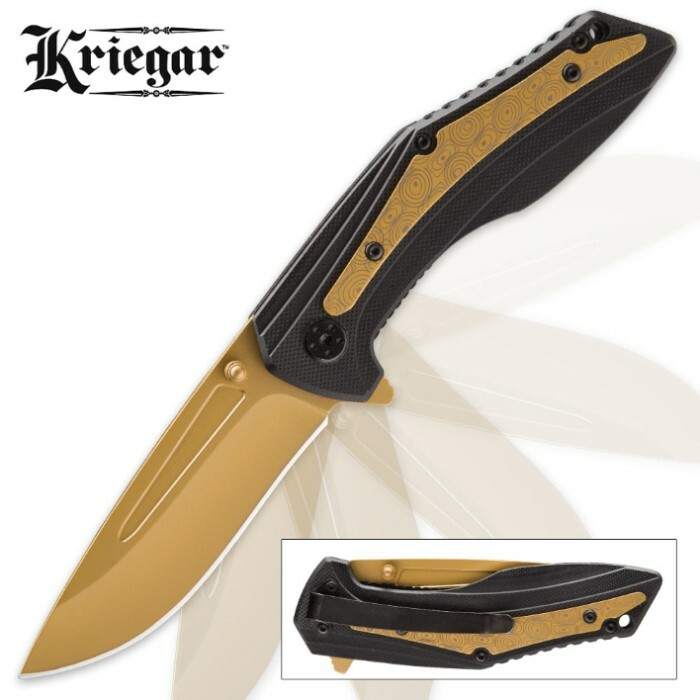 Kriegar Dawn Ecliptic Assisted Opening Pocket Knife - G10 Handle / Golden Titanium Finish | BUDK.com - Knives & Swords At The Lowest Prices! Kriegar's incredible Dawn Ecliptic Pocket Knife is a remarkably versatile folder with an ultramodern vibe and plenty of swagger to spare. Loaded with advanced materials and technology like G10 handle scales and a velvety smooth assisted opening mechanism, the Dawn Ecliptic is decidedly innovative in both looks and design. Its 3 3/8" drop point blade is forged from resilient stainless steel and boasts a brilliant golden titanium finish. Fierce and menacing, the blade's edge is carefully honed to razor sharp, and it deploys in a flash with just a nudge of the handy flipper or ambidextrous thumb studs. Once open, the sturdy liner lock keeps the blade firmly fixed in position for added safety and stability during use. Contemporary-chic G10 handle scales and smart relief lines yield a slick industrial look and an outstanding hand-feel that you just have to experience for yourself to fully appreciate. 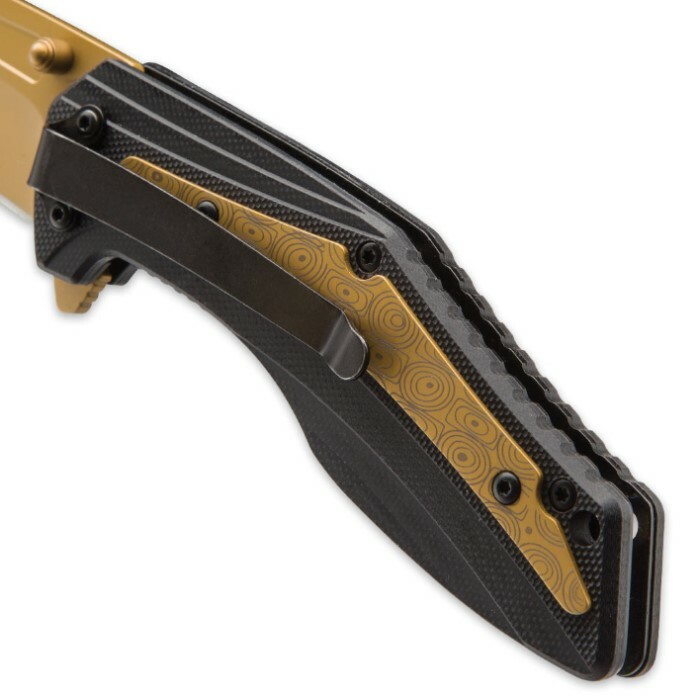 Steel accents featuring a mod orb-and-ellipse pattern grace each side of the Ecliptic's handle; the hip design is delicately etched on a dazzling gold background that stylishly mirrors the striking flat gold of the blade. At 4 5/8" closed, the Dawn Ecliptic is the perfect size for a wide range of cutting applications - everyday tasks around the house or farm, rigorous back country chores and everything in between. Still, it's compact enough to fit comfortably in jeans pockets and is easy to secure and/or tether, thanks to the convenient integrated pocket clip and lanyard hole. 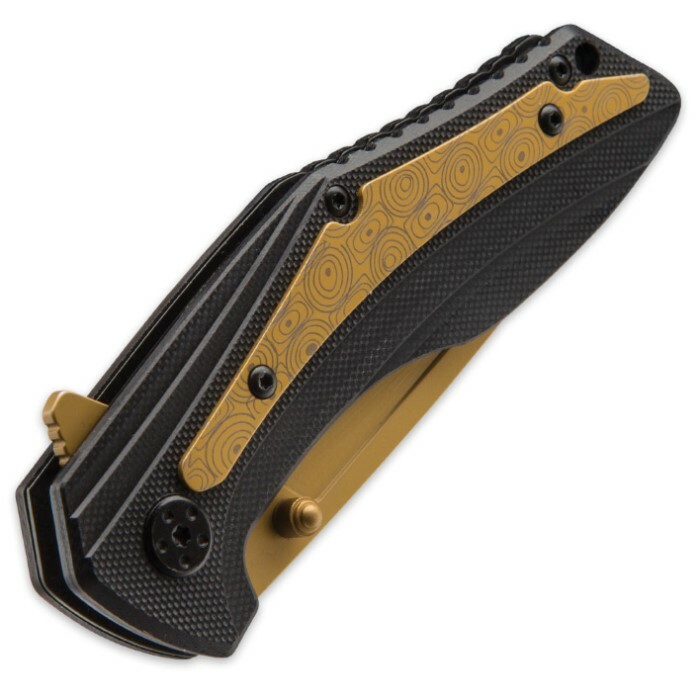 The Dawn Ecliptic is an all-around gem of modern folder design - from the durable G10 handles to the lightning quick assisted opening system to the stunning matte golden-hued blade. Need an affordable everyday carry that outperforms knives at three and even four times its price with loads of sultry swagger to match? Look no further than Kriegar's out-of-this-world Dawn Ecliptic Assisted Opening Pocket Knife. Check out its dark blue-hued sister folder, as well - the "Midnight Ecliptic" (sold separately)! Great knife great price buy one of these.